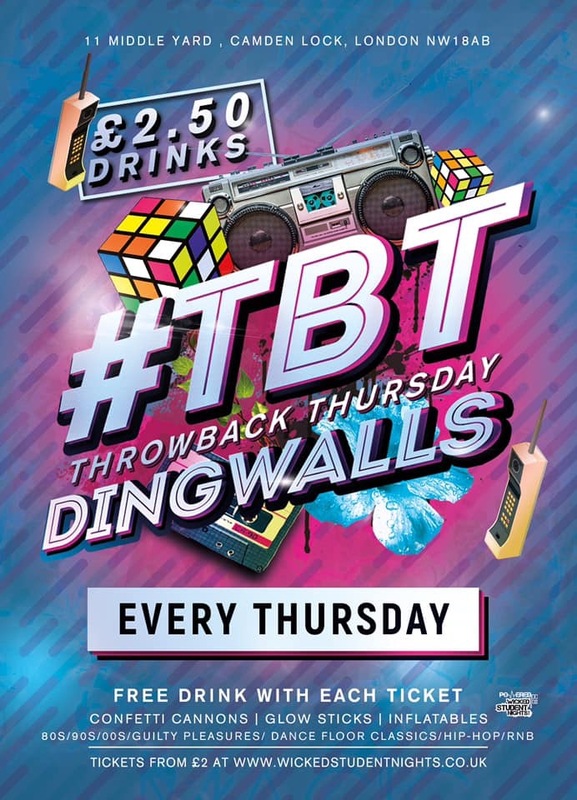 Located in the electric heart of Camden, #TBT brings you Throwback tunes every Thursday at DINGWALLS! With £2.50 drinks deals all night! Your Thursday night is about to be lit! Our top DJs will be playing the best of the 80s, 90s and 00s including those guilty pleasures we all love. Plus the best of hip hop and RnB Tunes! We will add a fun vibe to your night by giving out plenty of inflatables, glow sticks, and 1 FREE DRINK for the first 100 Tickets. Don’t miss our confetti showers at the end of the night. Please note: This event is for 18 and over . Valid ID is required. Warning: Entry without ID is strictly prohibited by UK law and regulations. No ID, No Entry.